When smokers were asked where they usually got their cigarettes, nearly nine out of ten purchased them for themselves from a retail source, most often from a small grocery or corner store (Figure 3.3). 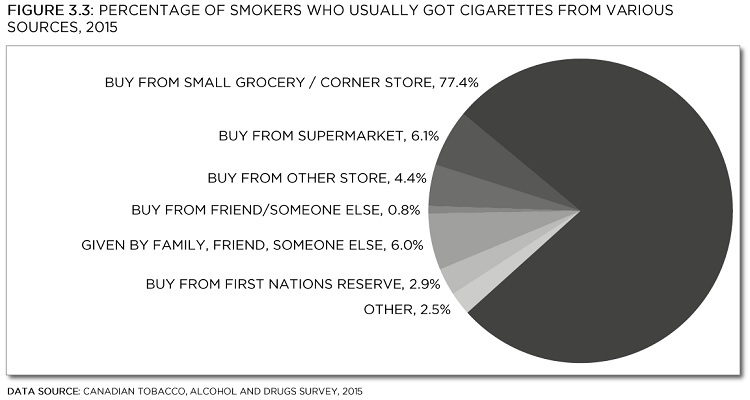 Only 2.9% of smokers stated their usual source of cigarettes as a First Nations reserve (either on-site or delivery service), and 2.5% cited “other” sources. The remaining 6.8% usually got cigarettes through social sources, most being given them a family member, friend, or someone else.